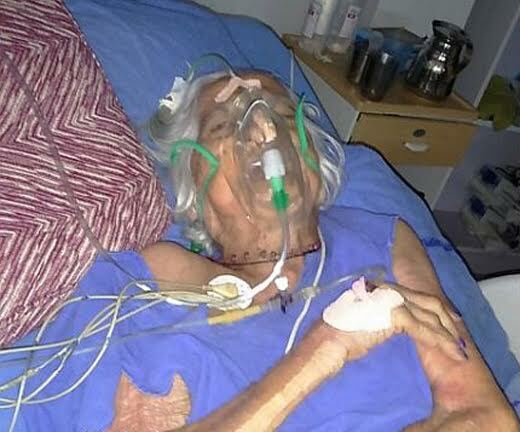 Mangaluru, July 15, 2016: Reports in the media reveal that a 92-year-old woman is on her death bed as per medical views, battling for her life at a private hospital at Matadakini in Mangaluru, compassionate activists have complained to Senior Citizens Helpline (1090) that her ’adopted son’ Arun Kumar, has abandoned her, though she sheltered and cared of him, his wife and three children for the last 25 years. It appears that Arun Kumar has also registered Alice D’Souza’s apartment in his name, stolen all he material assets and the old woman is virtually on the street. Alice D’Souza’s treatment bill in the hospital crossed Rs 1 lakh and the hospital too filed a complaint against Arun Kumar, who initially arrived at the hospital after the neighbours informed him, signed the ’consent form’ in the hospital and later is not seen. According to Alice, Arun Kumar and his family, who were staying with her abandoned her about three months ago and she was living all alone. However, on June 30, when she took ill, her neighbours admitted her to Global Hospital. She was diagnosed with malaria and jaundice. Alice D’Souza, states Arun Kumar approached her about 25 years ago as a paying guest. Subsequently, he gained the full confidence of the aged lady, Alice considered him as a son and Arun too used to call her as ’mummy,’ she recalled. It is said Alice lost her husband (Nicholas D’Souza) when she was just 29 years old and lost her only son (Franklin D’Souza) when she was 39 years old. Since then, she was living all alone until, Arun approached her in 1991 to be her paying guest. Though she had purchased the apartment in the same year (1991) after selling her property in the city, she had not registered it and she had entrusted all the work to Arun himself. However, he reportedly registered the apartment (in Duke’s Manor at Matadakani) in his name and though she came to know about it after a few years, she presumed that her ’adopted son’ would take care of her in her last days. As she does not have any option now, she has filed a complaint to Senior Citizen Helpline on July 5, 2016. Acting on the complaint, the police personnel brought Arun Kumar to the hospital and he reportedly told the police as well as hospital that henceforth he would take care of her. However, later he has refused to pay the bills, said hospital. Quite interestingly, on the following day of his ’promise’ to the hospital as well as police, Arun has filed a complaint with the Barke police that gold jewellery in his (Alice) home is missing and he has suspected the neighbours. The neighbours came to know about it only when the police started inquiries. The neighbours have alleged that Arun Kumar has taken all the furniture and kitchen items from the home. One of the neighbours said that Arun has mortgaged the apartment and is presently running a paying guest facility near Kudroli wherein more than 25 students are staying as paying guests. It is reported Alice looked after Arun, his wife and three sons just like her own children all these 25 years and she almost single handedly brought up the children as both Arun and his wife (a teacher in a prestigious school) were out of home throughout the day and this is the final result for all the consideration. Even Arun’s family, for whom she has done all that a ’mother’ can, have not shown any human feelings here. People should note what is commonly happening now and be alert and take care. Get well soon grandma. We all are with you. We can understand your pain. Your son will realize his mistake soon. He might be worried about the Hospital bill? Merciless son. His adoption was her fate and curse at old age. These days are not far from you and your wife (a useless teacher)Kumar. You will get for what you have done. The lady had adopted you and this life is her gift to you. You didn’t know who your parents were.One who took care of him is in death bed and You are happily leading life with your family. To be ashamed of this act. If the Lady wouldn’t have adopted him she would lead a Happy life. Its worth not having children instead of such.